A rendition of a Dua Lipa song by a Hull diabetes consultant with new words conveying the message of insulin safety has won a prestigious national award. The Inpatients Diabetes Team at Hull and East Yorkshire Hospitals NHS Trust came up with its own version of the hit-song ‘New Rules’ named ‘Insulin Rules’ during Insulin Safety Week in May. Consultant Diabetologist Dr Belinda Allan starred in the video ublished on Vimeo and YouTube in a bid to educate staff about the safe use of the drug insulin, which is administered to people with diabetes, but if used incorrectly can be lethal. The message ‘right insulin, right dose, right time, right route, right device, right patient’ was at the heart of the performance. 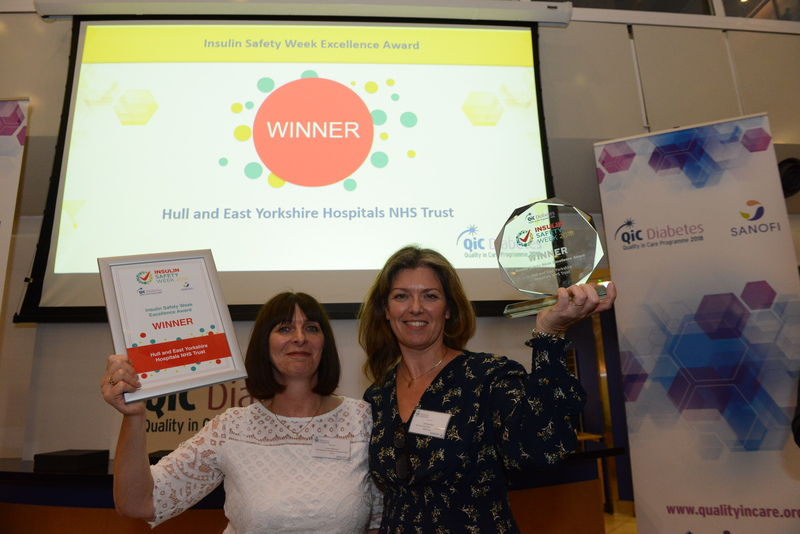 The video led to the trust picking up the Insulin Safety Week Excellence Award at the Quality in Care Diabetes Awards on Thursday, October 18, beating the competition of 22 other entries. The annual awards, held in Guildford, are staged to recognise initiatives that improve the quality of life for people living with diabetes. Insulin Safety Week Song from HEY Hospitals NHS Trust on Vimeo. Almost one in five (18 per cent) people with diabetes in hospital on insulin experienced at least one insulin error, according to theresults from the 2017 National Diabetes Inpatient Audit1. In response, the first-ever, national Insulin Safety Weektook place between May 14 and 20, 343 sites made up of hospitals and medical centres across the country taking part in the campaign, sponsored by Sanofi. Participating sites staged training events to raise awareness. Resources, including leaflets, guidelines and educational slides, were used to help spread the word. Hypo Awareness Week Excellence Award judges led by Simon O’Neill, Diabetes UK’s Director of Health Intelligence and Professional Liaison, were tasked with deciding the winner. Insulin Safety Week was organised by Orange Juice Communications and has been funded by Sanofi who have had no input into any arrangements or content.